For operation over phone-lines, line item 72 of the 1941 manual (ref. 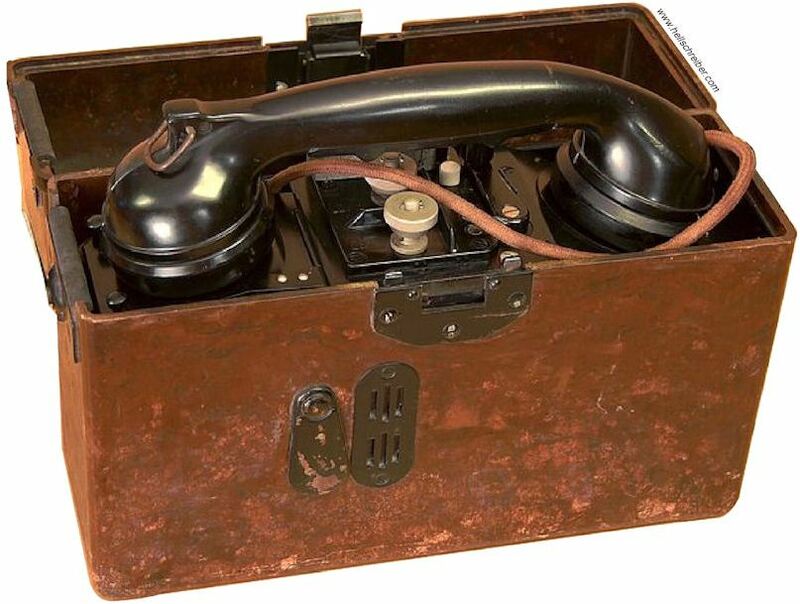 1) prescribes that a Feldfernsprecher (field telephone) be connected to the Feld-Hell's electronics box. It is used to call the opposite station. One end of a phone patch cord is plugged into the La-Lb/E jack of the Feld-Hell, the other end is plugged into the side of an FF 33 Feldfernsprecher telephone set. Ref. 2, 3, 4 provide a good overview of this standard telephone set. As the designator "33"suggests, the FF 33 was developed in 1933; it entered service in 1934 with the Reichswehr (the national defence forces) and Reichspost (the national postal/telecom system). The FF 33 was built until the end of WW2. There were at least 20 manufacturers (ref. 2). It continued to be used with the Bundespost and Bundeswehr until well into the 1970s! Compared to its 1926 predecessor, the FF 26, it has a case made of molded Bakelite, rather than a wood. The FF 33 includes a battery ("Ortsbatterie", OB), and a crank-inductor. Just before the WW2, the model was modified to make it suitable for long-range operation (affected units have a green marking). The FF 33 is the equivalent of the American EE-8 field telephone, which remained in service until well after the Vietnam war. The "Mithören" (monitoring) output of the Feld-Hell is for hooking up a standard 4000 ohm headset. I use a Dfh.a "Doppelfernhörer" (thank you Rolf!). This is a common set of double headphones, with two 2000 ohm "ears" in series - typical for headsets of the era. Per the 1941 manual (ref. 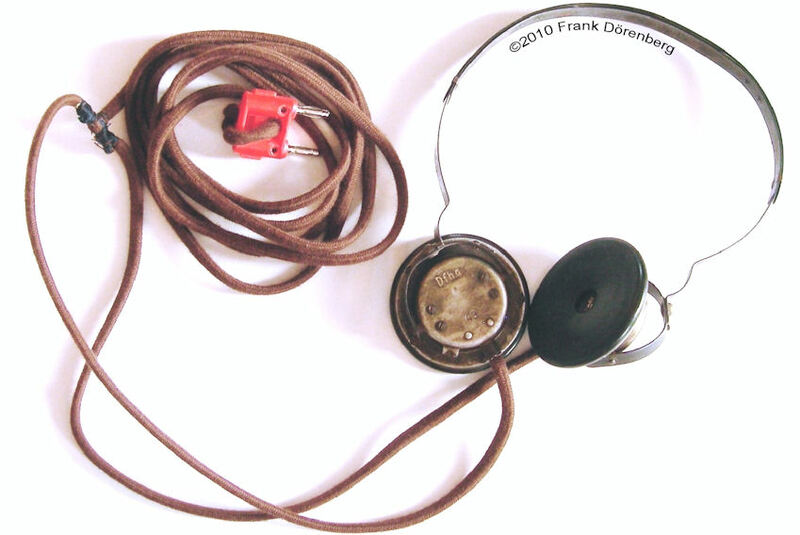 1), the headset gives better sound quality than a field-telephone, and is also used for monitoring the own-station's Morse telegraphy signals (when using the Morse key of the keyboard). My headset came with household zip-wire cord. I replaced it with very flexible cloth-covered tinsel wire (which is near impossible to solder). I'm still trying to locate original double-plugs. Over the years, the magnets in the ear pieces tend to lose their strength, hence, volume of the sound. They can be re-magnetized with a strong permanent magnet, or an electro-magnet. Ref. 5, 6. When inserting a plug into the 12-pin round connector on the Feld-Hell's electronics box, the contacts of the character drum (and Morse key) are diverted to this connector. They can be used for direct keying a CW transmitter. Direct keying is no problem with solid-state CW transmitters or tube transmitters with a solid-state keying relay. However, older tube transmitters may have significant negative or positive voltage at the key input connector. This depends on whether grid (grid-block) keying, cathode keying, or anode keying is used. Key-down current draw may also be significant. This may exceed the voltage, current, and power limits of the Hellschreiber's character-drum and slip contacts. Rudolf Hell and his co-workers (ref. 8A, 8B) recommend such direct keying only for low power tube transmitters. 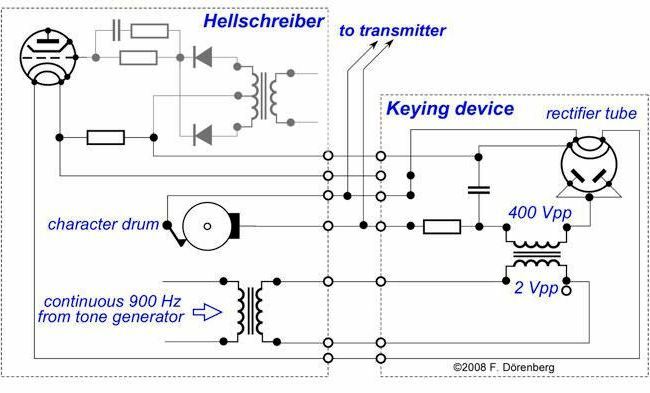 For medium power (up to 100 W) they describe a simple keying device ("Tastgerät") between the drum contacts and the transmitter's key input. It basically generates a high DC voltage. The circuit takes the continuous 900 Hz tone of the Hellschreiber (available at the 12-pin round connector), transforms its 2 Vpp amplitude up to 400 Vpp, which is then rectified. Ripple smoothing is done with a simple RC-filter. The resulting voltage is passed through a large current-limiting resistor (1 MΩ) to the keying input of a grid-keyed transmitter via the Feld-Hell's drum contacts (accessible at the 12-pin connector). They short the keying input when pixels are transmitted. 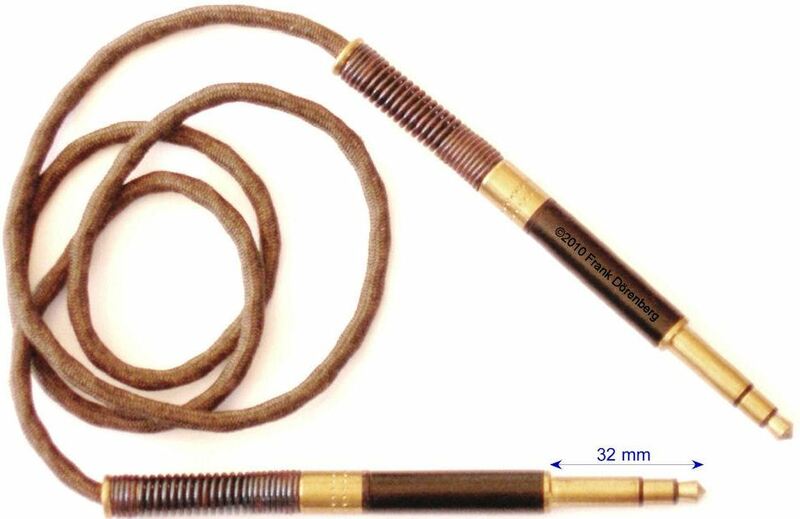 Anode voltage and 12 volt DC heater-filament power for the rectifier tube is also available at the 12-pin connector. 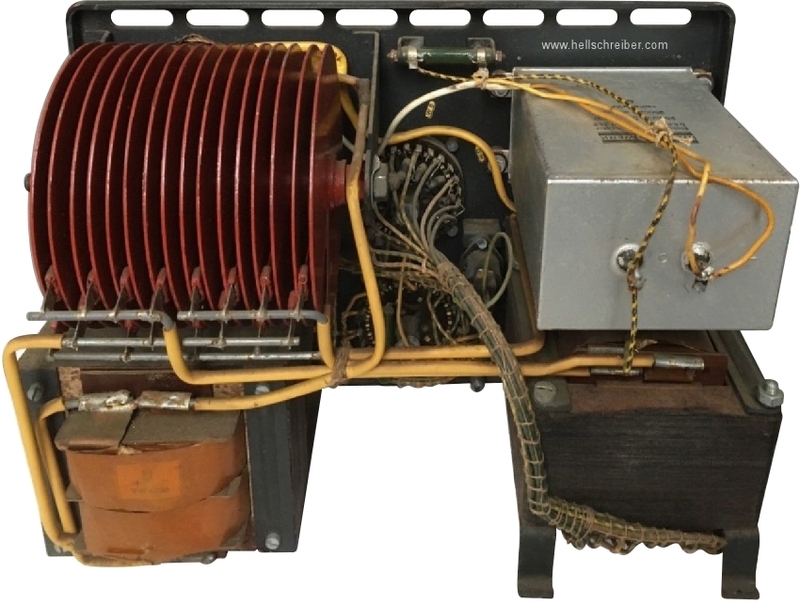 A special keying device was available for the 100 WS transmitter: Tastzusatz Tz. (Fu) 100 WS. (ref. 9). It comprised a fast keying relay: Siemens-Halske type T.rls. 54b (Bv 4/726). Remote keying could be achieved for distances of 3 km (≈2 mi) over regular "Feldkabel/Feldfernkabel" field phone lines, and up to 50 km (≈30 mi) over "Dauerleitung" permanent field phone lines. The same keying device was also used with the 15.W.S.b transceiver. Fig. 10: patch cords and keying device of "Tastzusatz Tz. (Fu) 100 W.S." 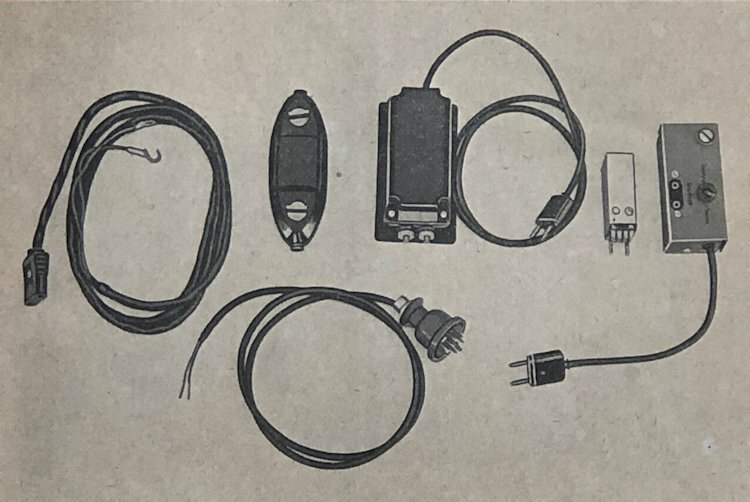 This Siemens-Halske keying device is shown in the photos below, with the toggle switch and binding-post banana jacks labeled in Swedish (for the Feld-Hell machines of the Swedish army): HELLSKR = "Hellskrivare" = "Hellschreiber", TGF-NYCKEL = "Morse/telegraphy key", La - Lb/E = "Leitung" = phone line (same "La, b/earth" marking as on the Feld-Hell), "S - M" = "Sända - Mottaga" = Send - Receive. This keying device had the Swedish military stock number stock number "Tc 20033", later "M3936-105219". REMOTE ON/OFF CONTROL - "ANRUFGERÄT"
Across phone lines, the range of Feld-Hell communication is significantly larger than that of voice communication. During normal operation over phone lines, the receiving station would be called and notified that a message was about to be sent. Beyond a certain range, the receiving station could not be called. To remedy this limitation, an small "Incoming Call Alert" device ("Anrufgerät") was conceived that would detect incoming 900 Hz Hell-signals. The output of the device could be used to activate a warning light or buzzer. That same output could also be used to activate the receiving Feld-Hell machine, if its main switch was in the "Bereit"/standby position (the necessary access to the switch contacts is provided via the 12-pin connector). The circuit of the device is similar to a VOX-circuit that detects a tone and closes a relay contact (with appropriate hang-time). The amplitude of the received 900 Hz tone pulses is significantly increased with a transformer (Tr1). 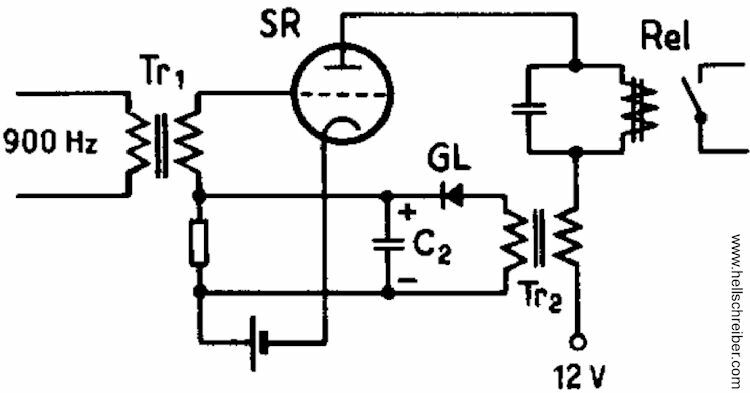 The amplifier tube (SR) is biased such that in absence of a tone (< 10 mV), the anode current is insufficient to energize the output relay. The amplifier tube uses 12 volt DC from the Feld-Hell's 12-pin connector as its anode voltage. The amplified signal is further increased with a transformer (Tr2), rectified, filtered, and added to the grid-bias of the tube. The filter capacitor is large enough such that the detector does not drop-off until no signal is received for the duration of several characters. It is unknown if such devices were ever manufactured for the Wehrmacht. On wired circuits involving the public telephone network, the output of the Feld-Hell sometimes had to be reduced by 1 neper (≈8.7 dB) to 0 neper (0 dB): 1 mW = 0.92 volt at 800 ohm (note that a "600 ohm" POTS line has an impedance of 800 ohm for a 900 Hz tone!). This was done by inserting an attenuator-plug into the 12-pin connector socket of the Feld-Hell. The attenuator consists of a simple voltage divider (two resistors). The one shown below was used by the Swedish army on their Feld-hell machines (hence, the embossed Swedish military part number Tc 21115). I do not know if such attenuators were used outside Sweden. POWER-SUPPLY - "GLEICHRICHTER" / "NETZGLEICHRICHTER"
Besides a 12 volt car battery, the Feld-Hell can also be powered by a 12 volt transformer-rectifier unit such as the standard "Gleichrichter a" shown below. Early versions of these power supplies had rather poor power regulation, especially under low load conditions. This is why there is a switch on top of the electronics box of (most) Feld-Hells. It puts a load resistor in series with the 12 volt power input, to avoid over-voltage conditions when the Feld-Hell is in the stand-by ("Bereit") mode. The unit measures 33.5x23.5x21 cm (WxHxD, ≈13.2x9.3x8.3 inch) and weighs 15 kg (≈33 lbs). 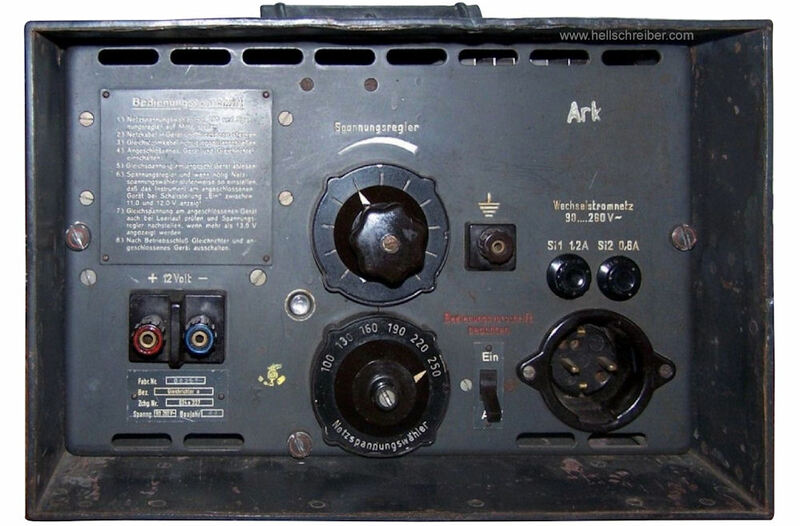 The marking "Ark" at the top right-hand corner of the front panel means that the equipment was suited for arctic use. This particular unit has a yellow Wa.A. 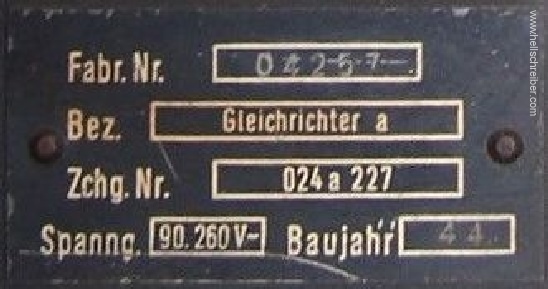 acceptance stamp to the right of the equipment label, but the number is illegible. Fig. 17: the inside of an other "Gleichrichter a"
Ref. 1: "Der Feldfernschreiber", document D 758/1 of the Oberkommando des Heeres, Heereswaffenamt, Amtsgruppe für Entwicklung und Prüfung, Berlin, 1 April 1941; this is the official original manual in German for model T.typ.58 (a.k.a. model 24a-32, a1, a2, based on drawing numbers). Ref. 1A: "The Feldfernschreiber", annotated translation of "Der Feldfernschreiber" by me, Frank Dörenberg (N4SPP), update 2 May 2009. Ref. 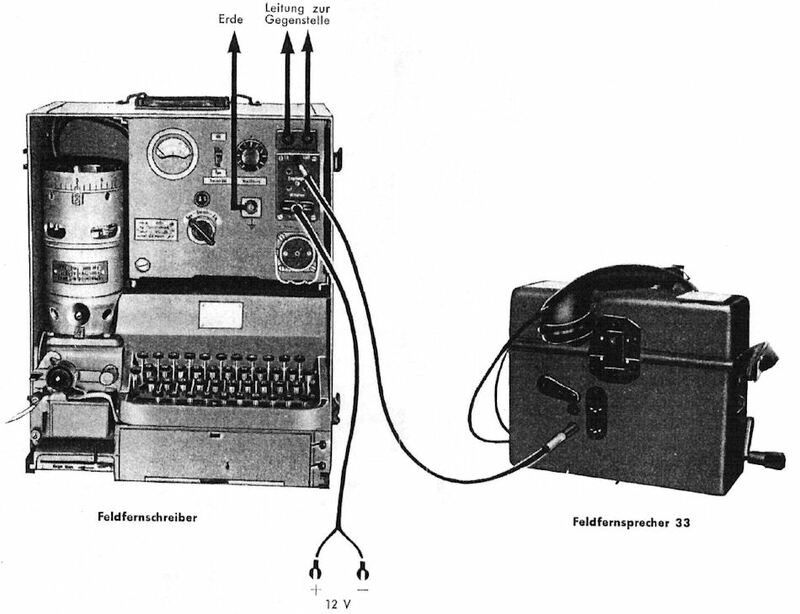 2: "German Field Line Communication equipment of WW2", R. Caspers, Funksammler Publ., 2010, 147 pp. [17 MB] See note 1. Ref. 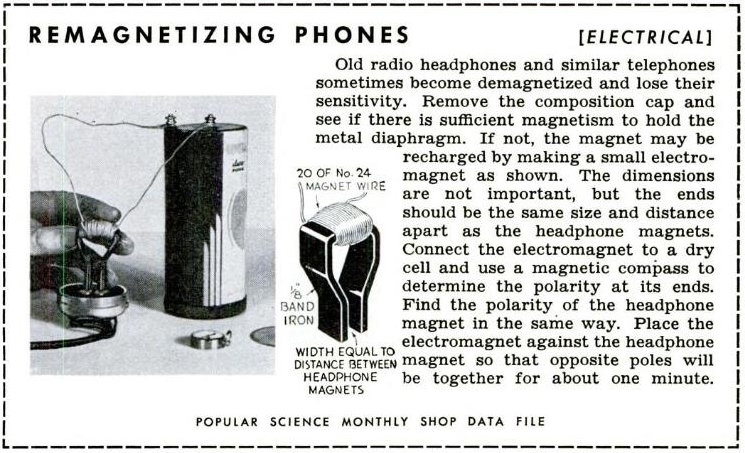 5: "Einfaches Verfahren zum Aufmagnetisieren alter Kopfhörer" [simple process for re-magnetizing old headphones], Helmut Kern, in "Funkgeschichte" (Gesellschaft der Freunde der Geschichte des Funkwesens e.V. ), Heft 130, 2000, pp. 82-83. See note 1. Ref. 9: "Merkblatt für die Bedienung des Tastzusatzes zum Feldfernschreiber (Tz. (Fu) 100 WS.)" [manual for the Feld-Hell keying device for the 100WS and 15WSb transmitters], Heereswaffenamt, Amtsgruppe für Entwicklung und Prüfung, Berlin, 1 January 1943, D 9016/5, 24 pp. Note 1: due to copyright reasons, this file is in a password-protected directory. Contact me if you need access for research or personal study purposes.